Direct measures of the ecological condition of waterbodies have received a recent surge in interest within California’s water quality management and regulatory programs because biology-based assessments have several advantages over chemistry- or toxicity- based assessments. Biological assessments are more closely linked to the beneficial uses to be protected and chemistry- or toxicity-based criteria usually lack the predictive ability to infer biological condition. Ultimately, California needs to develop biology-based standards, or biocriteria, as a regulatory tool for monitoring and protecting aquatic life use. Biological assessment tools, including biocriteria, attempt to objectively “score” the biological integrity at a given site. A crucial component to the development of assessment tools is understanding biological expectations at reference sites that consist of natural, undisturbed systems. These reference systems set the biological condition benchmarks for comparisons to the site(s) being evaluated. 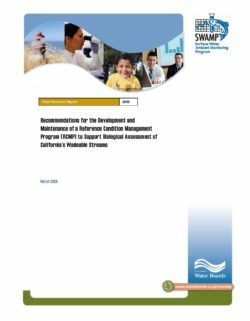 Two recent external reviews of the State Water Board’s Surface Water Ambient Monitoring Program (SWAMP) affirmed the importance of a sound statewide reference condition program (i.e., TetraTech 2002, SPARC 2006). In October 2007, the SWAMP bioassessment committee assembled a technical panel of statewide and national experts in bioassessment. The panel met for three days to develop a set of recommendations that the SWAMP program could use to establish and maintain a comprehensive reference condition management program (RCMP). The program accounts for biological variation caused by natural environmental gradients and balances statewide consistency with the flexibility needed to adapt to California’s diverse regional settings. Furthermore, the plan allows for adaptive refinement over time.